First, they’re bigger than they look, whether you see them on this website or in a shop. 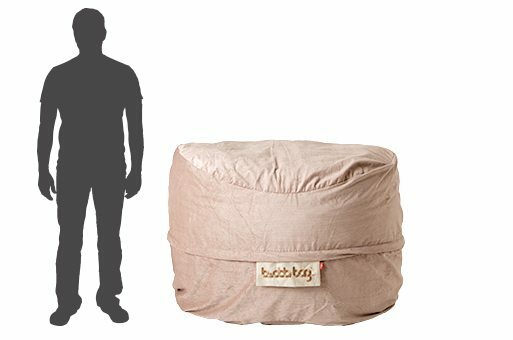 Once you get them home, out of the packaging, and fluffed up, you’ll be surprised how much bigger your Budda Bag appears in your room. So always measure out the required space in your own house, using a tape measure or sheets of A4 paper. The second reason is that the size you should get depends on the way you’ll use your Budda Bag. Every Budda Bag comes wrapped in its own hardwearing, easily removable and machine washable cover. You can buy a new cover for your Budda Bag at any time, allowing you to completely change the look and feel of your Budda Bag in minutes. All our covers are cut and sewn in Ireland or the UK, and are guaranteed against defects for a year from purchase. This short guide will help you to choose the perfect cover for your Budda Bag. Recommended Accessories: Support your head and neck with an OobiDoobi, get allround arm, shoulder and neck support with an Akimbo Long Neck. We start with this one because it’s our most popular Budda Bag. The Midi is best regarded as a very generous large armchair or a sumptuous minisofa for two close companions (or parent and child). If you’re feeling self indulgent, this king sized single seater has no equal for luxury and comfort. 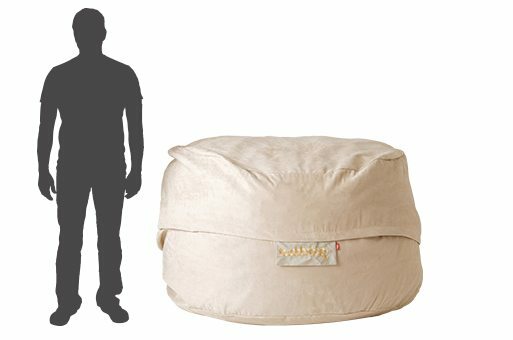 You can stretch out and just bask in the support of thousands of tiny memory foam pillows inside the Budda Bag. The Midi Budda Bag is great for lounging in front of the TV, playing console games, listening to music, reading, or just having a snooze in the sun. You’ll soon figure out how to make your Midi Budda Bag support your weight in all these situations. If you’ve someone close to share with, a Midi Budda Bag makes a perfect snuggle seat for two adults or you and the kids. Accessories: Support your head and neck with an OobiDoobi, get all round arm, shoulder and neck support with an Akimbo Long Neck. The second most popular Budda Bag is the Mini. Don’t let the name fool you, this is plenty of Budda Bag for the money, and is a wonderful and highly flexible alternative to a luxury armchair or recliner. With plenty of room to spread out, you’ll be reluctant to move after enjoying the support of all that memory foam. The Mini Budda Bag, just like its bigger brother, is great for watching TV, playing games, listening to your iPod or HiFi, reading a book or newspaper, or just catching a few Zzzzz’s. Once kept fluffed up, your Budda Bag will adjust to your sitting style in seconds. Great for a couple of kids to enjoy watching TV or playing games together, and perfect for you and a smaller child to have some relaxing quality time. Finally, this is the ultimate Budda Bag. 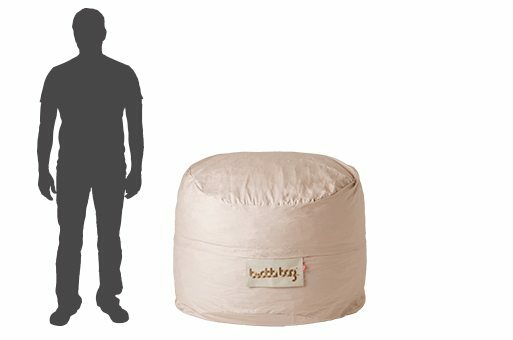 This will allow you to dispose of our sofa and bring Budda Bag comfort to your room. However, it is VERY BIG!!! This will accommodate 3 adults sitting side by side in a sofa function. There is more than enough space for 2, and doubles up as the most comfortable guest bed ever, with your overnight guest up before you making your breakfast unfortunately not sold with product!). This is one for ALL the family, but beware!!! You’ll need lots of space. Colours: Deep Brown, Mushroom Beige, Flaming Red, Royal Blue, Black. Hardwearing but soft to the touch, our Corduroy Budda Bags are practical, affordable and yet luxurious. There’s something special about the chunky texture when you’re sitting in a Corduroy Budda Bag that you have to experience for yourself. Colours: Wooden Brown, Sandy Beige, Liverpool Red, Electric Blue, Black. Made from topquality cotton, a Denim or Canvas Budda Bag Cover is tough yet sophisticated, and the finish allows for a purer and more striking colouring than our other fabrics. For the ultimate in feelgood, our Microsuede Budda Bag Covers are dressy and silky to the touch. Microsuede is an artificial cloth which is fully machine washable and easily spot cleaned, yet it has a sheen and feel which says luxury and comfort. Microsuede has the added benefit of having a fluorocarbon coating, very like scotchgard. This means the microsuede Budda’s are perfect in high traffic areas like playrooms, kids bedrooms, schools and creches.